When Planet Vegeta is on the verge of destruction, Freeza summons the entire Siayan army back to Vegeta. Bardock is suspicious of this right away, and assumes that Freeza is preparing to get rid of all of them as they will be a thorn in his side later. He heads home and finds Gine, who had been preparing meals and watching over Goku's nativity tube. She beccomes an all-important confidant, as Bardock is unable to get any of the others to believe his suspicions against Freeza. Bardock and Gine then decide to send Goku away, just in case that Freeza is preparing something to destroy them. 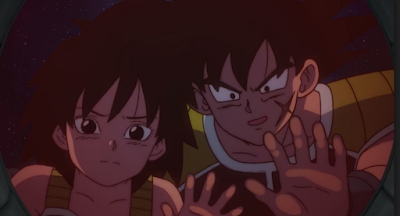 Gine is worried, but wonders what would happen if Bardock happened to be wrong. He then responds that if Freeza doesn't destroy them, then he'll go get his son at a later date. The two then decide to load of one of the pods and send Goku to Earth. With tears in their eyes, the two send Goku away. Gine mentions that Bardock's never shown that level of care to his family before, notably Raditz, and he responds that with his entire life of killing, if he could do one bit of good, that would be saving his son from certain destruction. Unfortunately, later Bardock's worst fears come true and Gine is one of the Saiyans on Planet Vegeta seeing Freeza's incoming blast hit the planet while it's too late to stop it all. So while previous versions of Goku's origin story completely erased his mother from the proceedings, it's revealed in Dragon Ball Super: Broly that she becomes an important emotional confidant for Bardock. Kind of taking the place of his Saiyan warrior friends in Bardock - The Father of Goku, Gine instead keeps it all in the family.